* For those of you who are interested in learning about our club and the facilities available to its members, we hope that you find this web site interesting and useful. If you have additional questions please do not hesitate to contact us and we will do our best to answer them. * For our members, please visit often to stay informed. * If you have a valid ATT and would like to visit our club, Print a Range Invitation. *Membership Applications can be printed out, completed and returned to the club by mail or drop off any Friday evening at 7PM. This site is constantly being expanded and updated. The Niagara Falls Revolver Club is owned by its members, which is comprised of a very diversified group of individuals. Our membership is made up of men and women from all walks of life, however the one common factor that they all share is a love for the shooting sports and a sincere desire to pursue this interest. Volunteers make all of this possible. Beginning with the Board of Directors who, along with the membership, volunteer their time and their expertise to perform the many tasks that are required to keep the club in operation. We look for these same qualities in our new members and ask that they too be willing to do their share, so that we all may continue to benefit from what the Club now provides its members, and to ensure that it will continue to grow in the future. The Niagara Falls Revolver Club is a non-profit club, incorporated and registered with the province of Ontario. The Club was established in 1955 and grown from its original 23 charter members to it's present level of approximately 96 members. The building also has undergone several changes during its 60 year history, and continues to be improved by its Directors and Members. General membership meetings are held as required and an Annual General Meeting is held each year. The club is overseen by a 10 member Board of Directors, elected each year at the Annual General Membership Meeting. The Board of Directors, through monthly meetings, governs the operation of the club and all financial matters pertaining to the club. The Niagara Falls Revolver Club offers its members a relaxing indoor atmosphere in which to enjoy their sport year around. The clubs 7 shooting lanes are 50 feet in length, comfortable, well illuminated and ventilated. Located in the northeast side of Niagara Falls, near the Niagara River on Buttrey Street, the club is readily accessible from all of the Greater Niagara Region. Members have access to the club building seven days a week between the hours of 8 AM and 10 PM. If you like to simply come out and enjoy casual target practice on your own, you will find that frequently you have the range to yourself. 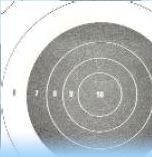 If you are of a more competitive nature, Friday night the club is the site of organized Bullseye Target shooting. Both Rim-fire and Center-fire relays are conducted. Wednesday evenings you will find club members competing in the Niagara Frontier Pistol League during the winter season. Informal practice shoots are held every Wednesday evenings during the summer. There are lifelong rewarding values and satisfaction from participating in competitive activities, even if you are only competing against yourself. The NRA Galley Pistol [Bullseye] competitive shooter is participating in one of the three most difficult individual disciplined sports games in the world. The other two, are worldwide Professional Golf and International Trap. The Niagara Falls Revolver Club is a member of the Niagara Frontier Pistol League, and participates actively in its yearly shooting schedule. The Niagara Frontier Pistol League is the longest continuously running association of its kind in North America. Member clubs are located in both Canada and the United States. © Copyright 2002-2016 All Rights Reserved, Niagara Falls Revolver Club Incorporated.